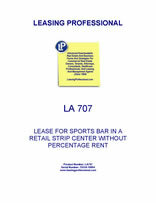 This Lease (“Lease”) is made as of _________________, by and between COMMERCIAL PROPERTY LANDLORD, INC., a __________________ corporation (“Landlord”), and AGREEABLE SPORTS BAR TENANT, INC., a _________________ corporation (“Tenant”). (1) Landlord agrees that only Tenant will be allowed signage on the center tower. The tower signs will be designed by Tenant and approved by Landlord. (2) Landlord grants to Tenant a $________ per square foot expense stop against CAM, taxes & insurance. i.e., Tenant pays its rata share of CAM, taxes and insurance less $_______ per sq ft per year. Landlord hereby leases to Tenant and Tenant hereby leases from Landlord certain premises (the "Premises") in the Shopping Center for the term, at the rental, and upon all the conditions and agreements set forth herein. The location of the Premises within the Shopping Center is shown cross-hatched on the site plan attached hereto as Exhibit A, but if there shall exist any discrepancy between the location shown on Exhibit A and the location of the actual demising walls of the Premises (as such walls presently exist or as they are hereafter constructed under Landlord's supervision and with Landlord's approval) the location of the demising walls shall control. Notwithstanding anything to the contrary contained herein, the term "Shopping Center" as used in this Lease does not include anything outside the boundaries of the land described in Exhibit A-1 attached hereto, it being understood that the site plan attached hereto as Exhibit A may depict more than the Shopping Center. The Premises contain approximately the number of square feet of floor area that is specified in the Basic Lease Information and are located on the floor level(s) specified in the Basic Lease Information. The Premises shall not include and Tenant shall not be entitled to use the land lying thereunder or any part of the exterior walls of the buildings in which the Premises are located or the roof thereof or any space other than on the floor level(s) indicated in the preceding sentence. The term of this Lease shall commence on the date (the "Commencement Date") that is the earlier of (i) the Scheduled Commencement Date specified in the Basic Lease Information, (ii) the date specified in Exhibit B attached hereto, if any, as the latest possible Commencement Date, and (iii) the date on which Tenant opens for business in the Premises; and the term of this Lease shall expire on the expiration date specified in the Basic Lease Information (the "Expiration Date"). Such term is hereinafter referred to as the "Lease Term" or the "term of this Lease". After the Commencement Date has been determined and Tenant has accepted possession of the Premises, Tenant shall sign and deliver a certificate upon request of Landlord in the form attached hereto as Exhibit C.
Tenant shall pay Landlord for each month in the Lease Term a guaranteed minimum monthly rental for the Premises ("Minimum Rent") as specified in the Basic Lease Information. Such Minimum Rent will be due in advance beginning on the Commencement Date and continuing on the first day of each calendar month thereafter. It will be prorated on a daily basis for the first month if the Commencement Date is not on the first day of a calendar month and for the last month if the Expiration Date is not on the last day of a calendar month. Minimum Rent shall be payable without demand, deduction or offset, at the address for Landlord set forth in the Basic Lease Information, or at such other place as Landlord may from time to time designate in writing. Any amount to be paid by Tenant to Landlord hereunder in addition to Minimum Rent is additional rental (whether or not so designated in the following provisions) payable upon demand or as otherwise provided herein. Tenant shall use and occupy the Premises solely for the permitted use and under the trade name specified in the Basic Lease Information and for no other purposes. Tenant shall conduct its business activity in the Premises during all business hours usual for Tenant's type of business, unless Tenant is prevented from doing so by Applicable Laws (as defined below) or by strike, fire or other casualty beyond Tenant's control and except during reasonable periods approved by Landlord in advance for repairing, cleaning and decorating the Premises. Without limiting the foregoing, Tenant shall not use or permit the Premises to be used for any purpose that conflicts with existing lease in or restrictions affecting the Shopping Center or for any other use Landlord finds offensive or disruptive to other tenants in the Shopping Center. Tenant shall not permit the Premises to be used for any operation that is extra hazardous on account of fire or otherwise or for an operation that will increase the insurance premiums on the fire insurance carried by Landlord or that may render void or voidable the insurance carried by Landlord; nor shall Tenant sell or permit to be kept, used or sold in or about the Premises any article which may be prohibited to standard fire insurance policies. Tenant shall use and maintain the Premises in compliance with all laws, ordinances, building codes, rules and regulations, present or future of all governmental authorities ("Applicable Laws"), including Applicable Laws pertaining to health, safety, disabled persons and the environment. Without limiting the foregoing, Tenant shall be responsible for determining that its proposed use of the Premises is permitted by Applicable Laws and shall obtain any permits (including any certificate of occupancy) required for such use. Tenant shall comply with such rules and regulations as Landlord may from time to time reasonably adopt for the safety, care, good order and cleanliness of the Shopping Center. Landlord shall not be liable to Tenant for the failure of any other tenant or other person to comply with such rules and regulations. If the Permitted Use specified in the Basic Lease Information contemplates the operation of a restaurant by Tenant in the Premises, or if otherwise required by Landlord or any governmental agency having jurisdiction, Tenant shall at its sole cost and expense install and maintain grease traps and/or grease interceptors that Landlord deems necessary or desirable or that any governmental entity having jurisdiction shall deem necessary to handle liquid waste, including grease, oil or any material whatsoever which could damage, obstruct or overload any drainage, sewer or other systems.